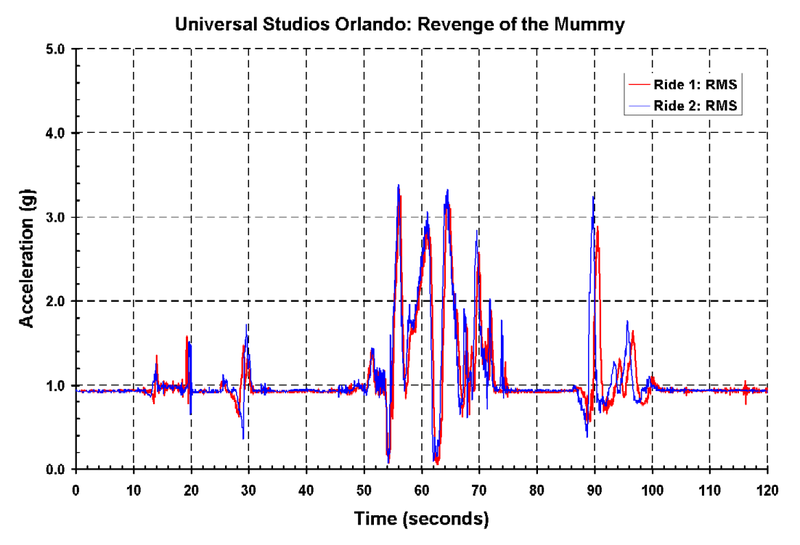 Walt Disney World was not enough so we took a USB Accelerometer to Universal Studios Orlando. After nine hours of driving by a guy who was born with a lead foot and insisted on the exclusive use of the right-hand side of the speedometer, we arrived in Orlando, FL ready to take on the Incredible Hulk Coaster, the Dueling Dragons, and the Revenge of the Mummy. The USB Accelerometer was mounted to the ride cars using a double-back sticky tape made by 3M. The tape allowed for direct coupling to the roller coaster and easy removal at the completion of the ride. However, the tape also introduced high frequency vibration noise into the data. 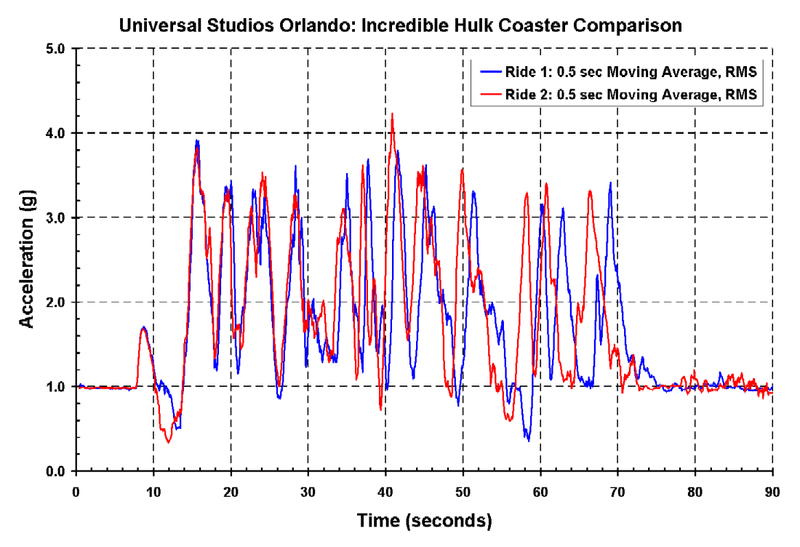 Wearing the USB Accelerometer, as opposed to attaching it to the ride, filters the roller coaster vibration and results in smoother data (see comparable rides from the Walt Disney World trip). Incredible Hulk Coaster: Located at Universal Studios Islands of Adventure, the Incredible Hulk Coaster features a 2-second launch to 40mph and a sequence of stomach churning inversions and loops. The plots below illustrate the initial 1.7g acceleration and a series of loops that peak at over 4g's. The second plot compares two different ride experiences. The blue line represents data collected from the front row of the coaster. The red line represents data collected from the middle row of the coaster. The data are very similar except for a prominent distinction exiting the launch and entering the first drop (between 10 and 12 seconds into the ride). 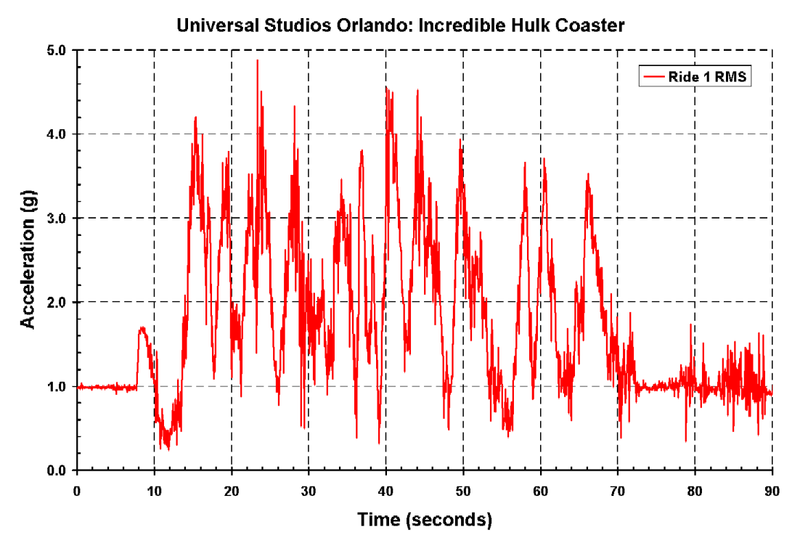 The difference in mass of each coaster (different loading conditions) likely caused the 2-second timing offset seen at the end of the two plots. 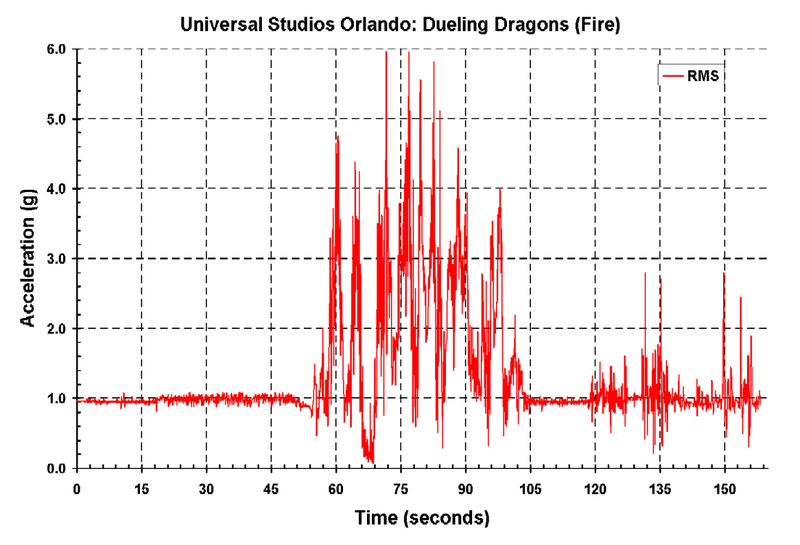 Dueling Dragons: Another top billed attraction at Universal Studios Islands of Adventure is Dueling Dragons, which features two entwined coaster tracks ("Fire" and "Ice") that pass 18 inches from each other. The data was collected from the "Fire" track. Surprisingly, the coaster peaks at nearly 6g's several times and includes a ~2 second free-fall. Revenge of the Mummey: Revenge of the Mummy is an indoor roller coaster based on the popular adventure movies "The Mummy" and "The Mummy Returns". The coaster has several pauses that introduce the Mummy character and the story line. The coaster was ridden twice and both data sets are plotted together. The two ride experiences are nearly identical except for a longer pause in Ride 1 just before the last track sequence (88-100 seconds). A full day was spent at Universal Studios' two adjoining parks. 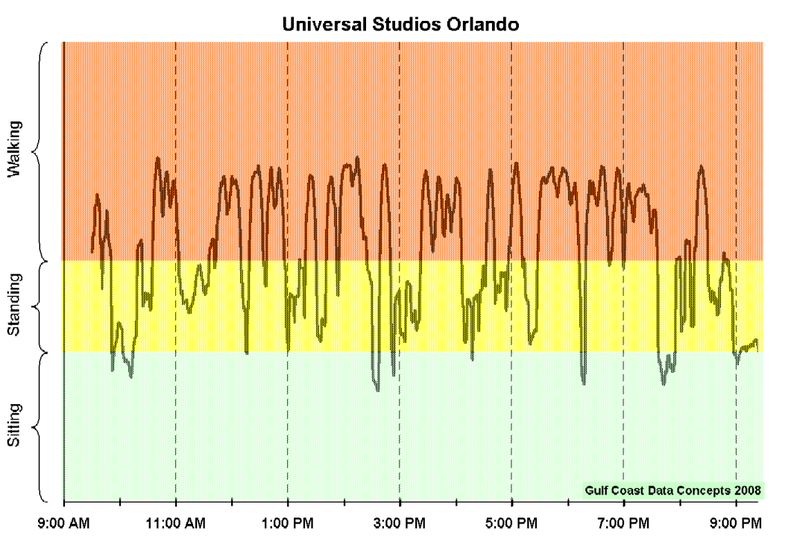 The activity level is illustrated below using the same analysis method established from a previous visit at WDW. The time spent at the parks was distributed 18% sitting, 35% standing, and 46% walking. The total of 81% standing and walking is very comparable to the experience at WDW, which was 78%. For those making a pilgrimage to the tourism capitol of the world, remember to pack a good pair of shoes and expect to test your physical endurance. 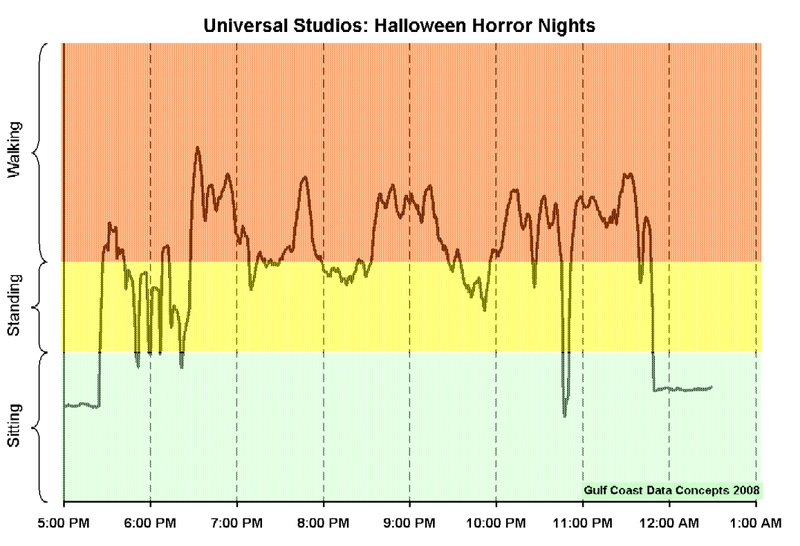 Another aspect to this data collecting adventure in Orlando was attending the Mickey's Not So Scary Halloween Party (MNSSHP) and Universal Studio's Halloween Horror Nights (HHN). In each case, a USB Accelerometer was worn at the waist to monitor physical activity. Analysis of the data provided the time spent walking, standing, and sitting during each event. Both events involved about the same amount of walking. 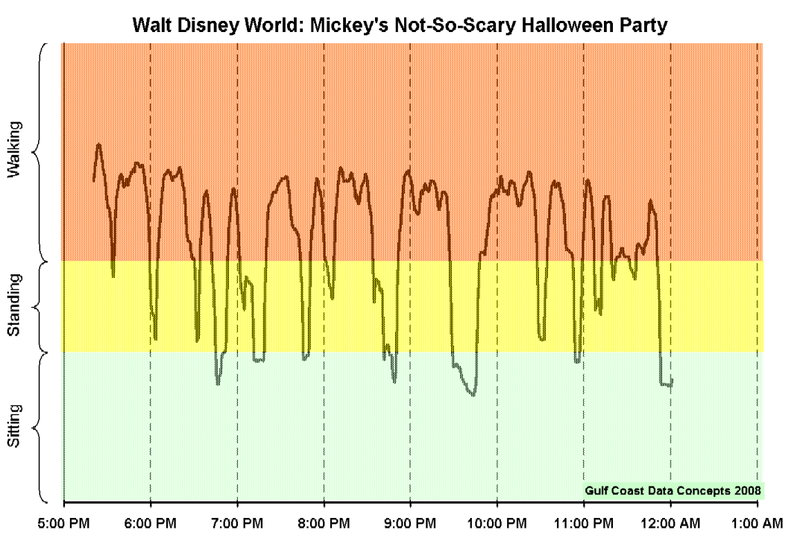 For MNSSHP, the time spent walking was due to the repeated attendance of the trick-or-treat candy distribution locations. Not seen in this data was the high frequency vibration caused by the excessively high blood sugar levels. A significant amount of time was spent standing in line at HHN. This was due to the extremely long lines (60-120min waits) for each of the 8 haunted houses. Only 3 of the 8 haunted houses were attended at approximately 7pm, 8pm, and 9:30pm. For those interested in experiencing Universal Studios HHN, the Express Pass option is highly recommended and will cut down the amount of time wasted standing in line.